Consider it a cosmic carousel with countless rings up for grabs. 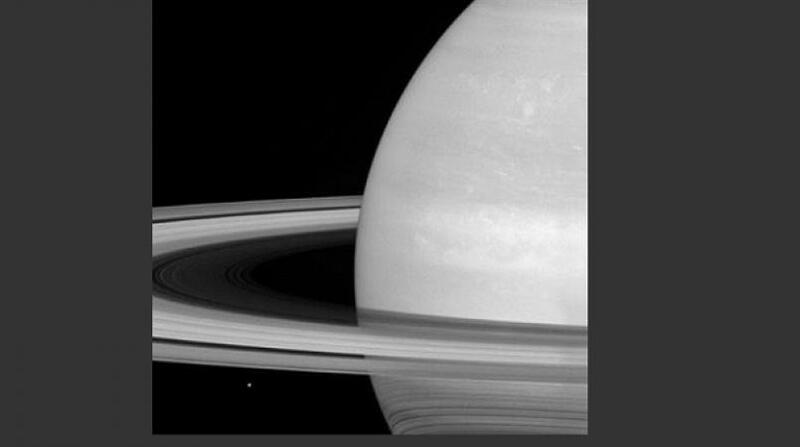 NASA's Saturn-orbiting spacecraft, Cassini, has begun an unprecedented mission to skim the planet's rings. On Tuesday, Cassini got a gravitational assist from Saturn's big moon Titan. That put the spacecraft on course to graze Saturn's main outer rings over the next five months. The first orbit of this new venture begins Wednesday night. Then on Sunday, an engine firing by Cassini should seal the deal, with the spacecraft making its first ring crossing. Launched nearly 20 years ago, Cassini will swoop down through the outer edge of rings every seven days. The spacecraft should make 20 dives through April, observing some of Saturn's many mini moons and even sampling ring particles and gases. This will be Cassini's last hurrah before a suicide plunge into Saturn next September. Saturn has five main rings, and other fainter ones, made up of chunks of ice and rock. First spotted by Galileo in 1610, the rings are named alphabetically in order of discovery. Initially, Cassini will cross a faint ring formed by meteors striking two mini moons, according to scientists at NASA's Jet Propulsion Laboratory in Pasadena, California. The spacecraft will venture into the fringes of the considerably more substantial F ring in March and April. This so-called F ring — a relatively narrow 500 miles (800 kilometers) wide — is Saturn's outermost major ring and appears to be in constant flux. "Even though we're flying closer to the F ring than we ever have, we'll still be more than 4,850 miles (7,800 kilometers) distant," project manager Earl Maize said in a statement. "There's very little concern over dust hazard at that range." At the same time, Cassini will pass as close as 56,000 miles (90,000 kilometers) above Saturn's clouds — until its grand-finale death dive. Cassini rocketed away from Cape Canaveral in 1997, went into orbit around Saturn in 2004, and released the European Huygens lander for touchdown on largest moon Titan in 2005. After logging more than 2 billion miles, the spacecraft is getting low on fuel, thus its intended demise in September 2017. FEATURED IMAGE CAPTION: In this undated photo provided by NASA, Saturn's icy moon Mimas is dwarfed by the planet's enormous rings. Consider it a cosmic carousel with countless ring up for grabs. NASA's Saturn-orbiting spacecraft, Cassini, has begun an unprecedented mission to skim the planet's ring. On Tuesday, Nov. 29, 2016, Cassini got a gravitational assist from Saturn's big moon Titan. That put the spacecraft on course to graze Saturn's main outer rings.